From Hymns for Times of Trouble and Persecution, by John and Charles Wesley, second edition, enlarged (London: Strahan, 1744), pages 61–63, alt. 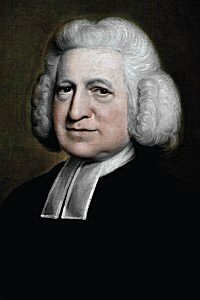 This source does not name the author, but it seems likely the hymn is by Charles Wesley. Vernon (Ingalls) in Christian Harmony, by Jeremiah Ingalls, 1805; this version is from A Compilation of Genuine Church Music, by Joseph Funk, 1835 (🔊 pdf nwc). The day, the evil day is near. A day of righteous wrath divine. To plague, and waste, and shake the earth. Marching in dread array appear! And ghastly ruin stalks behind. But one great dreary wilderness. The vales with clanging arms resound. And groans, and garments rolled in blood. Or stop their all victorious course. Unwounded champions of the Lord. The battlements of Heaven shall shake. When God, the glorious King, is near. When Heav’n and earth shall flee away.